Where Affordable Wyoming Beauty Begins! Hole 1 On Cedar Creek is a slight dogleg left. The best position for a drive would be the right center of the fairway. The second shot into the green does go a little uphill so you might need an extra club to get to the green. The green slopes slightly from back to front so make sure to watch the pin position. Hole 2 on Cedar Creek is a very tricky hole. Course knowledge is helpful on this hole. The tee shot is definitely a lay-up. Keep the driver in the bag. There is a very narrow area about 100 yards from the green. 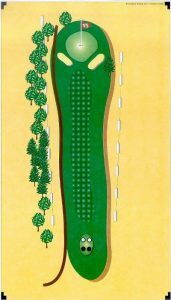 The fairway does slope downhill most of the way to the green so you can usually use one or two less clubs as the ball will roll onto the green. The green is also slightly crowned so try to keep the ball in the middle. Hole 3 on Cedar Creek is a straight forward Par 3. Sometimes the distance is a little deceiving so make sure you choose the right club. It does have out-of-bounds on both the right and left sides. Hole 4 on Cedar Creek is a downhill Par 4. 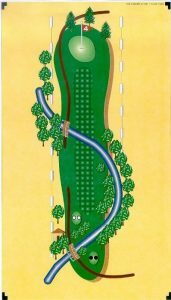 There is a small creek that runs in front of the tee box and then comes back across the fairway approximately 130 to 140 yards from the green. If you want to try to drive it, you will need to carry it at least 280 yards. If you lay-up, you can lay-up about 220 to 230 yards as the ball will roll slightly downhill. Approach shot to the green is again downhill. Take one or two less clubs. The green appears to slope back to the front but it is actually fairly flat. 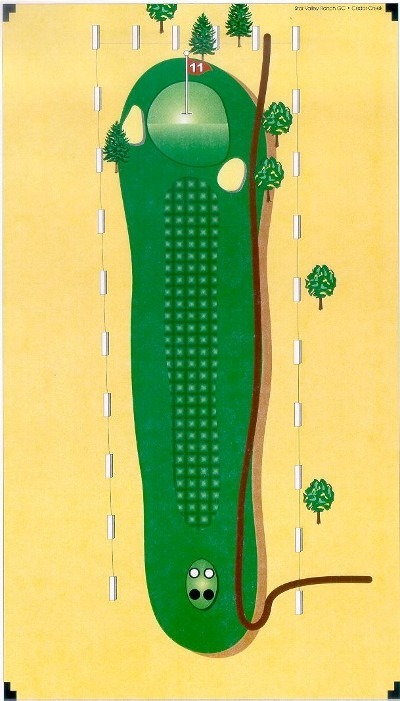 There is a steep hill behind the green which slopes away from the green so make sure to get the ball on the green. Hole 5 on Cedar Creek is one of the longest holes on the course, 580 yards, Par 5. It is fairly open on the driving; however, be careful of the out-of-bounds on the right as the ball does tend to bounce right if it is hit in that direction. 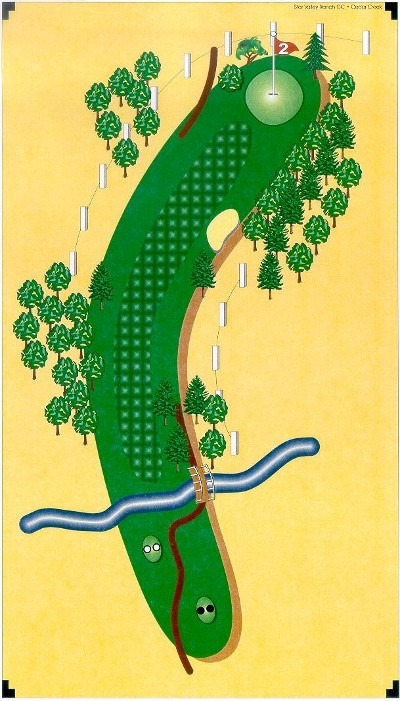 There is a small creek that runs down the entire length of the left side of the hole. There is plenty of room for driving. 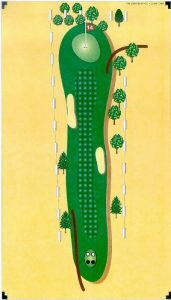 The second shots will have to go through a slight bottleneck as the fairway gets a little narrower with some trees coming into play on either side. Watch the approach shot to the green as the green does slope back to front. 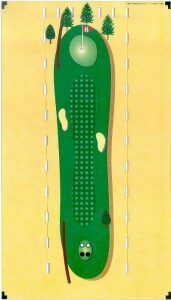 The backside of the green is mostly flat whereas the front side slopes towards the front. So if the pin is in the back, be sure to get the ball to the back. Hole 6 on Cedar Creek appears more difficult than it actually is. Ther is out-of-bounds on both sides of the green. The hole is a slight dogleg left. There is quite a bit of room for your driving area. The approach shot to the green is a little bit uphill and the green does slope back to front. There is a lot of trouble behind the green, so be sure not to go over it. Also check the pin position as the ball will not roll when landing on the green. Hole 7 on Cedar Creek is a 175 yard, Par 3. There is a lot of trouble on the left side of the green and on the out-of-bounds on the right. This is another green that slopes back to front. Check the pin position here again as the ball will not roll very far. Hole 8 on Cedar Creek is a very narrow hole. It is one of the toughest driving holes, but also one of the most rewarding. There is not a lot of trouble to stop your ball from rolling out-of-bounds right or left. However, the hole is not very long. At only 360 yards, a good drive will put you a short distance to the green. The green is very flat. Here is a good chance for a Birdie. 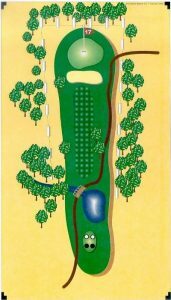 Hole 9 on Cedar Creek is the most difficult Par 5 on the Cedar Creek Course, 565 yards, dogleg left. 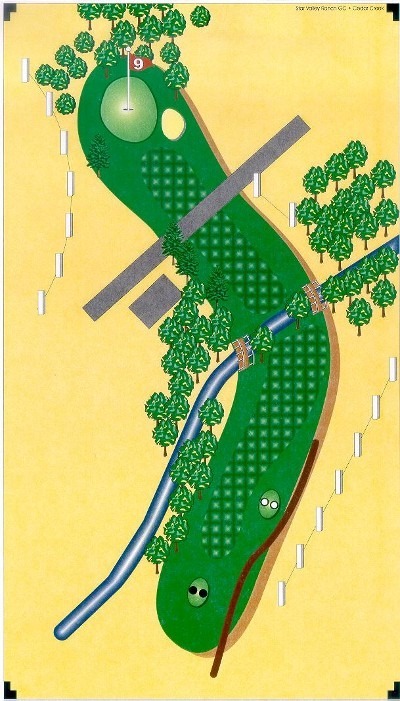 It is a 90 degree dogleg with Cedar Creek running adjacent to the left side of the first half of the fairway. The creek also crosses the fairway at the dogleg. Because of the creek, this hole is unreachable in 2. A lay-up off the tee will leave you 300 plus yards on your approach shot to the green. It is a 3-shot Par 5 approach shot to the green, with the backdrop of the Silo in the background. 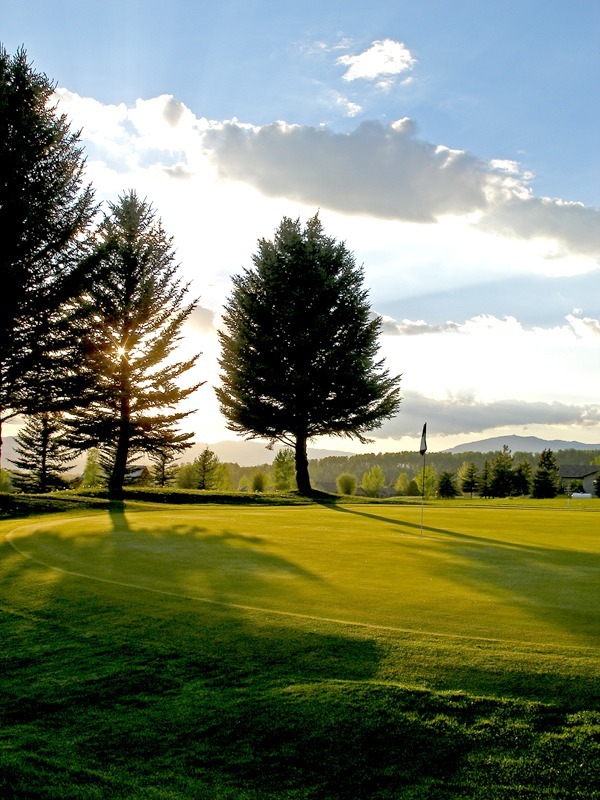 There is no room behind the green, so make sure your club selection will put you on the green. There is a little bit of out-of-bounds as you get near the green and also in the area near the creek. Hole 10 on Cedar Creek is a very reachable Par 5, only 480 yards uphill, dogleg left. There is a very wide driving area; however, there is out-of-bounds on both sides. There is a small pond on the left side as you get closer to the green. The green is a 2-tiered green so be sure to check to see if the pin is in the front or the back. 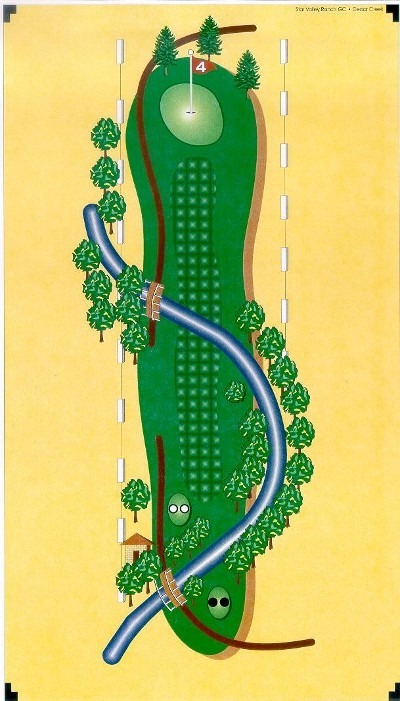 Most of the green slopes right to left and there is out-of-bounds behind the green as well. 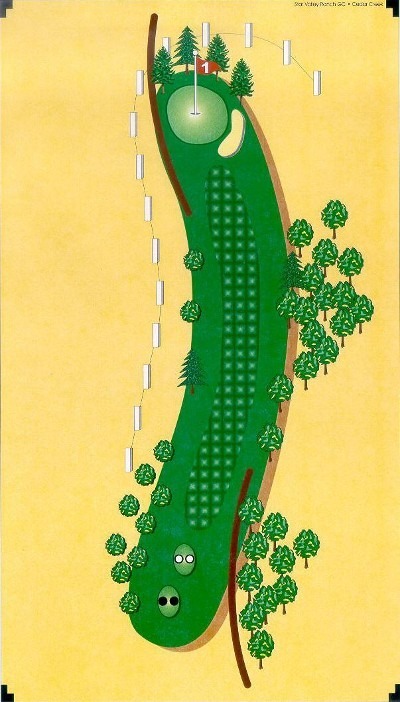 Hole 11 on Cedar Creek is a short Par 3; however, it has a very tough green. It is a 2-tiered green like Number 10; however, the front tier slopes back to front. If the pin is on the front tier, make sure your ball stays on the front tier. A lot of balls landing on the front tier will back all the way back off the foot. 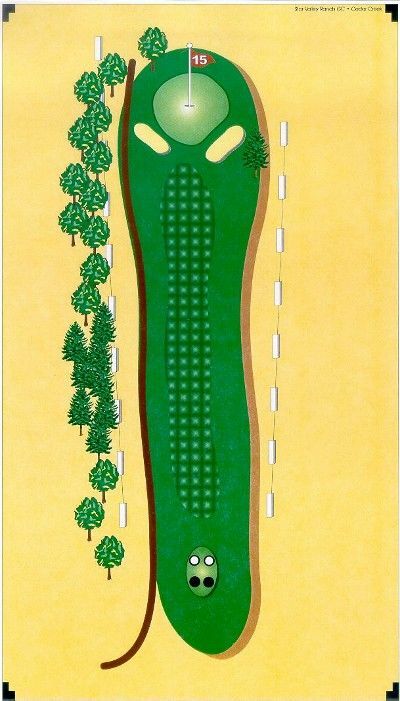 There is also an elevated green with slopes on the right and left sides of the green. Hole 12 on Cedar Creek is a sharp 90 degree dogleg left. Again, course knowledge here is very helpful. 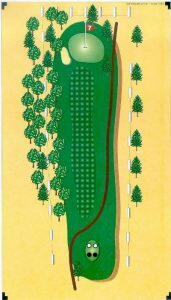 If you want to try to cut the corner, you need to keep it very close to the pine trees on the left side and also hit it up over the out-of-bounds. Watch your club selection as if you go too far, it will go out-of-bounds again. There are out-of-bounds on both sides of this hole. 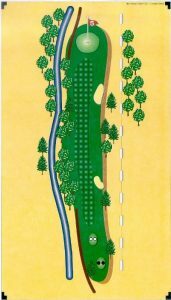 A good way to play this hole is to hit the ball about 200 yards off the tee, favoring the left side which will leave you about 160 to 170 yards into the green. The approach shot is a downhill shot into the green. You can take 1 or 2 less clubs depending on the wind. The green is fairly flat and will accept the ball very nicely. Be sure not to go over the green as there are some tree troubles and a slope off the green behind the green. Hole 13 on Cedar Creek is a slight dogleg right. It is not a long hole but there is a pond right in the middle of the fairway. Another lay-up will put you in good position here. 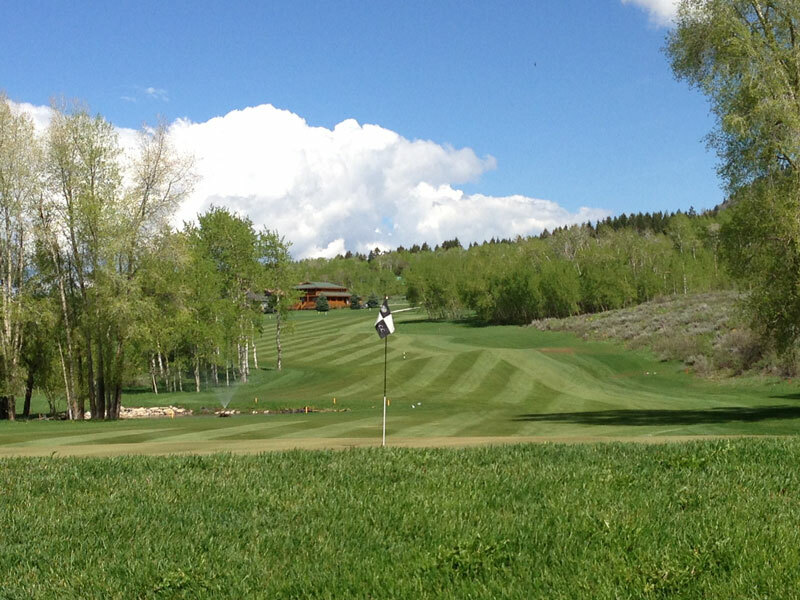 Lay-up about 220 yards off the tee and you will be less than 150 yards from the green. The green has quite a bit of slope right to left. It is very hard to keep the ball on the green so watch the pin position. This hole does have out-of-bounds on both the left and right sides of the hole with the road behind the green also out-of-bounds. Hole 14 on Cedar Creek is the most intimidating driving hole. It is not very long and not that narrow; however, with the fairway and the green both uphill and no trees, the out-of-bounds is very visible and very intimidating. There is out-of-bounds on both sides. A good drive down the middle will get you a short distance to the green. The green is extremely sloped from back to front, probably the worst slope of all the greens. Do not go past the pin with your approach shot. 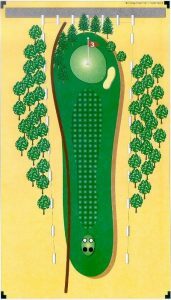 If the pin is on the front, you do not want to be on the back of the green. A putt from the back of the green to the front will not stop and will keep on rolling all the way off the front of the green. Be sure to watch the pin position and watch your club selection on your approach shot. 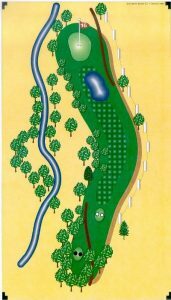 Hole 15 on Cedar Creek is a short Par 3, uphill all the way. The green is a little deceiving as from the tee box it looks very small. However, once you get up over the slope, it is fairly flat and a little larger than you think. Make sure that you do not go over the green as the hill behind the green makes a chip shot rather difficult. 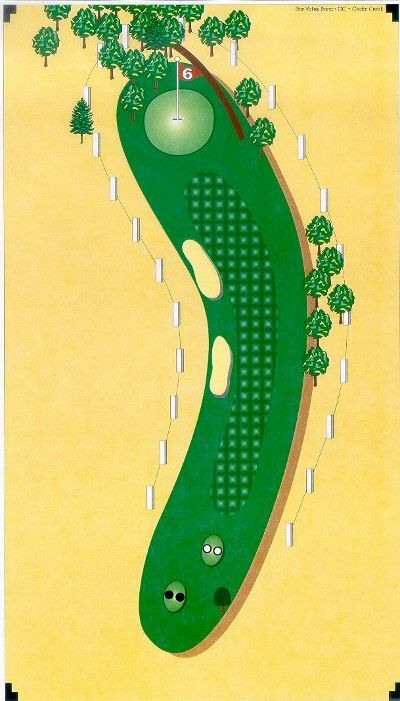 It is out-of-bounds all the way on the left side and right side of this hole so try to keep the ball on the green. Hole 16 on Cedar Creek is a downhill short Par 4, slight dogleg. 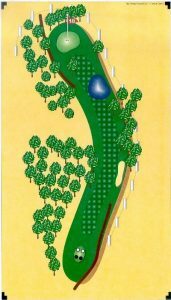 There is a small pond which is visible from the tee box, and the green is just on the other side of that pond. 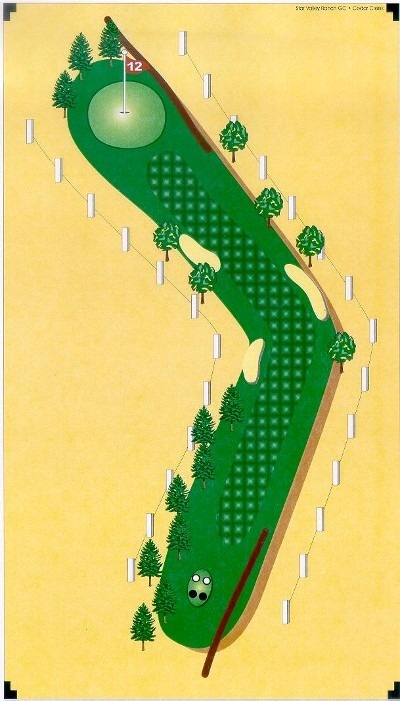 It is out-of-bounds on the right side with a lateral water hazard on the left side. Good driving position would be left center of the fairway. The approach shot is again downhill. Your drive will roll and will continue to roll down most of the fairway. Your approach shot will need to be high as you do not want to go over the green. 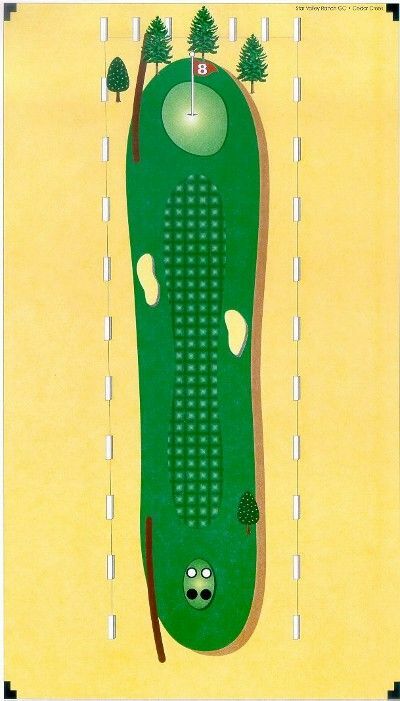 The green appears to slope back to front but because of the slope of the entire hole, the green itself is actually very flat. 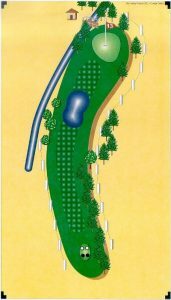 Make sure you do not go over the green as there is a steep slope behind the green; however, with the lateral water hazard in front of the green, it makes for an interesting approach shot. Hole 17 on Cedar Creek is the shortest Par 4 on the 18 hole golf course. At only 262 yards, it is possible to reach the green with your drive. However, it is very risky. Both the left and right sides are covered with out-of-bounds and it gets narrower as you get towards the green. 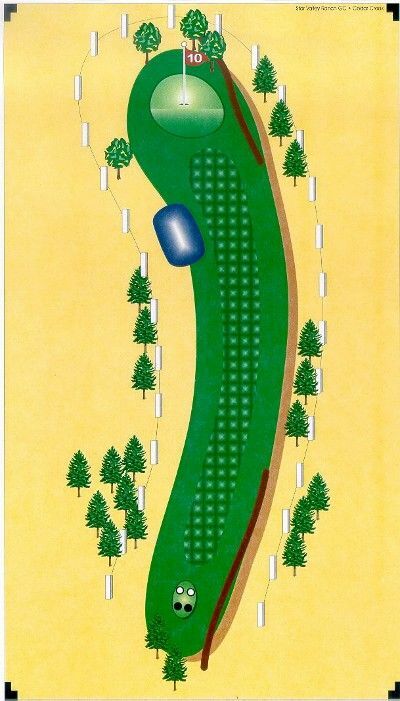 There is a large grass bunker in front of the green that you will have to carry in order to reach the green. The green is fairly large, sloping left to right and slightly back to front. Watch the pin position and try to aim just a little left of the pin. 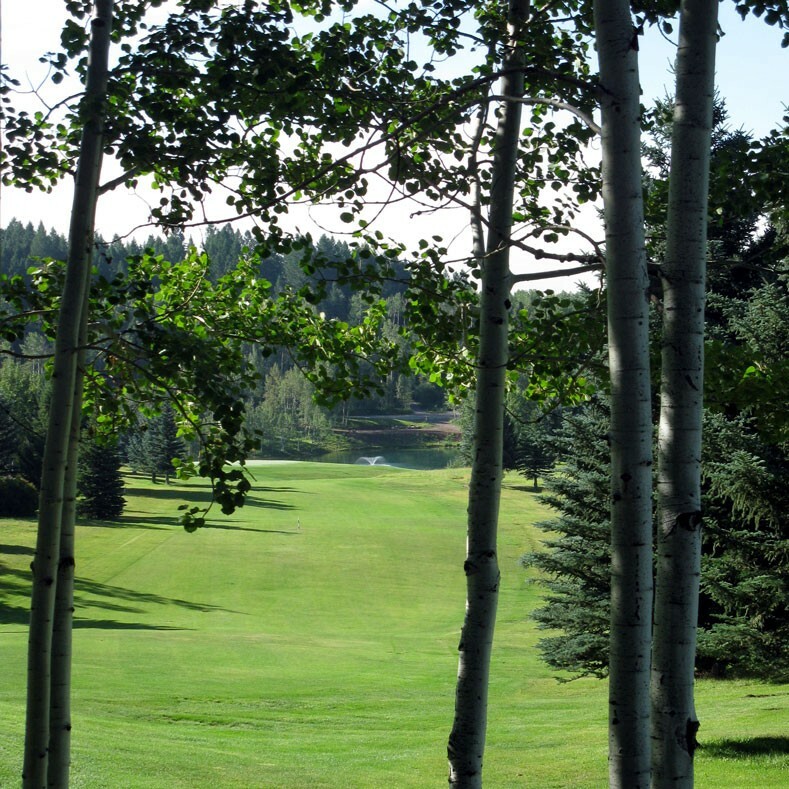 Hole 18 on Cedar Creek is a very difficult Par 5; however, it can be very rewarding. The hole is only 460 yards downhill all the way. If you want to hit a drive into the neck, you have to be very accurate as even the slightest shot left or right can put you in trouble. The best way to play the hole is to lay it up in the large area of the fairway. Hitting the ball about 230 to 240 yards off the tee will you with less than 200 yards onto the green as it will roll downhill on your tee shot. The green slopes very much from back to front. There is out-of-bounds on the right side of the whole length of the hole and the left side is marked as lateral water hazard. There is a small pond about 100 yards in front of the green, and the green is elevated sloping back to front. Try to keep the ball as close as possible.